Improve your conversations between your colleagues with Jabra Evolve 65 MS Wireless Headset. It is a professional headset that uses Bluetooth 4.0 for wireless connectivity that will allow you to connect up to 30 meters away from your PC, smartphone or tablet. With its dual connectivity, you can connect your headset to your PC using USB Dongle while you are also connected in a Bluetooth device. The Jabra Evolve 65 MS Wireless Headset has a noise-cancelling uni-directional microphone that produces clear and noise-free voice/sound. The headset battery last up to 7 hours and it is rechargeable with 120 minutes charging time. It come with a carrying pouch and a charging stand so you dont have to buy it separately. 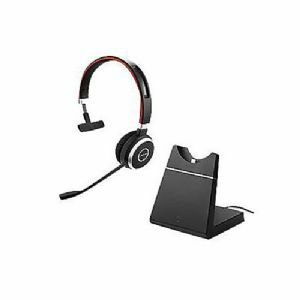 Buy Jabra Evolve 65 MS Wireless Headset now!